Adolf Hitler and his followers in the National Socialist German Workers’ Party (NSDAP) expressed a strong commitment to values and ideas. Under Hitler’s leadership, the NSDAP developed its own ideology that informed both its methods and objectives. They called this ideology National Socialism; today it is more commonly referred to as Nazism. To outsiders, ideology seems to have underpinned the Nazi movement – but while Nazism shared many common ideas and prejudices, Nazi ideology was relatively fluid. The NSDAP published very few clear and concrete expressions of its ideology. 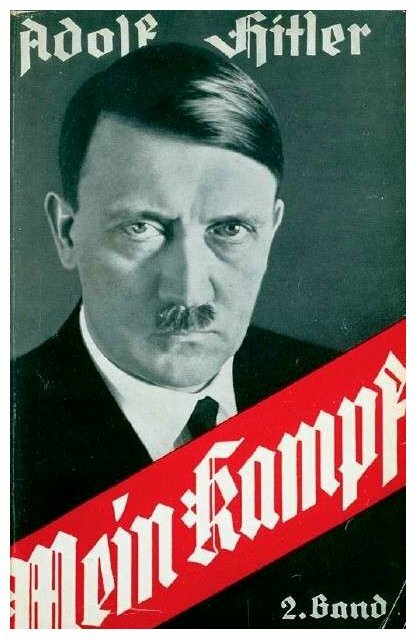 Two of the best-known articulations of Nazi ideology were the party’s 25 Points (drafted in 1920) and Hitler’s rambling memoir Mein Kampf (1924). In many respects, Nazi ideology was defined by Hitler himself. It was contained in his speeches, policy statements and orders. It changed frequently over time, as Hitler’s objectives changed, and could be confusing or contradictory. Nazism was one of three radical ideologies to appear in Europe after World War I. Fascism, often dubbed the ‘older brother’ of Nazism, took shape in Italy during the war. Devised largely by Benito Mussolini, fascism rejected socialism and democracy in favour of an authoritarian political and economic system, dominated by a single leader. Soviet socialism, a left-wing ideology with elements of totalitarianism, emerged after the 1917 Bolshevik revolution in Russia. Nazism had some similarities to both, particularly fascism – but it was also a distinctly national phenomenon, derived from ideas, events and conditions that were peculiar to Germany. Nazi ideology was developed by hardline nationalists whose only interest was the future of Germany and German-speaking Aryan people. As a consequence, the Nazis had little interest in fostering an international movement, exporting their ideas to other countries or changing the world outside Europe. Their chief concern was the restoration of German economic and military supremacy. Authoritarianism. The Nazis desired strong government and extensive state power. They believed that the government could not function effectively if it lacked the means to impose itself on society and enforce its policies. Decisions should be made by a leader with almost absolute power (a Fuhrer). All political authority and sovereignty rested with this leader, who should be trusted by the people to make important decisions on their behalf (fuhrerprinzip). No other political parties or organisations other than the NSDAP could be tolerated. Other groups with political influence, such as unions or churches, would be restricted or abolished. Totalitarianism. For the Nazis, state power had few limits and could extend into all aspects of German political, social and cultural life. They believed it was the government’s duty not just to devise policy but to shape, coordinate and regulate society for the betterment of the nation. A totalitarian government must have the authority to control the press and unions; restrict civil liberties and freedoms; manage education and employ propaganda. Liberal freedoms from government power – such as civil liberties, individual rights and freedoms – were considered irrelevant and subordinate to the interests of the state. Before total war, Nazism was a potpourri. Racialism and nationalism jostled shoulders with the socialistic revolutionary conservatism of many members of the Mittelstand (middle class). Romantic ideas came from right-wing youth groups. Hitler could utter the gospel of anti-capitalism to workers and the gospel of profits to businessmen. It was a rag-bag of inconsistent and incoherent ideas. Nationalism. Nazism was first and foremost a nationalist ideology. It was concerned only with Germany and German interests: restoring the German economy, achieving economic self-sufficiency, rebuilding its military and providing for the German people. The Nazis had little interest in forming or improving international relationships, except to advance German interests. They detested diplomacy and despised multilateral groups like the League of Nations. Hitler and his followers had no intention of honouring or abiding by existing foreign treaties or negotiating new ones, except where it might help them fulfil their own objectives. Militarism. Hitler and his followers believed that re-arming and expanding Germany’s armed forces was essential for the defence of the nation. Rearmament would be carried out in defiance of the restrictions imposed by the Treaty of Versailles. Hitler also considered military strength essential for expanding the German state. The organisation and culture of the NSDAP were fundamentally militaristic, as evidenced by the size and popularity of the party’s paramilitary groups the Sturmabteilung (SA) and Schutzstaffel (SS). Expansionism. Hitler and the Nazis dreamed of unifying the German-speaking Aryan peoples of Europe into a greater German state. To achieve this, Hitler believed his regime would need to acquire lebensraum, or ‘living space’, to accommodate the needs of the new Germany. This ‘living space’ would be seized from the non-Aryan people of eastern Europe, in countries like Czechoslovakia, Poland and Russia. The first step to creating this greater Germany would be to achieve anschluss: the union of Germany and Austria. A ‘third way’. The horrors of World War I and the global economic crisis of the late 1920s saw many people reject existing political and economic systems, such as parliamentary democracy and capitalism. Socialism emerged as one alternative system – however, both Nazism and fascism considered themselves a ‘third way’, an alternative to both democracy and socialism. Hitler was famously hostile to democracy, which he considered a weak and indecisive form of government, too prone to interference and infiltration by destructive forces. He also despised communism, regarding it as a Jewish invention to enslave entire nations and non-Jewish races. Economic sovereignty. Economic power, prosperity and self-sufficiency were priorities for the NSDAP. The Nazis sought the creation of jobs for unemployed Germans, the restoration of national prosperity, the recovery of industrial production and the rearming of the military. They believed the role of the state was to manage the economy, dictating what should be produced, allocating resources and managing labour. Unemployment would be dealt with by putting the unemployed to work for the benefit of the state. The Nazis had no objection to the private ownership of capital, provided these capitalists were willing to meet government priorities – and provided they were not Jewish. Traditional values. Conservative traditions were a strong feature of Nazi ideology. The Nazis often painted themselves as a new movement but they were not averse to promoting or exploiting traditional values. 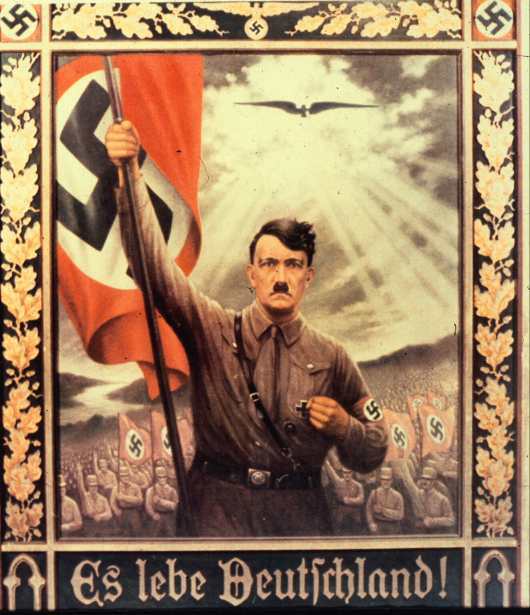 Hitler frequently spoke of protecting long-standing German values, including Christian beliefs and volkisch connections to the land. He often harked back to the 19th century when Germany was ruled by men of steel like Otto von Bismarck and German society was relatively untroubled by disruptive influences like socialism, liberalism, democracy and women’s rights. Racialism. Their dark obsession with race separated Hitler and the Nazis from many other fascist and nationalist groups. The Nazis considered Aryans – those of Nordic heritage, with blonde hair and blue eyes – to be Europe’s ‘master race’. According to Nazi racial theory Aryans were physically stronger, more intellectually advanced and more culturally gifted than other European races. The Nazis saw races like the Jews, Slavs and Romany to be untermensch (‘inferior men’). The Nazis embraced the pseudo-science of eugenics, that claimed society could be improved by adopting policies of ‘genetic hygiene’, such as the compulsory sterilisation or euthanasia of the mentally ill or disabled. Volksgemeinschaft. Translating as ‘people’s community’, Volksgemeinschaft did not originate with the Nazis but emerged from the difficult years of World War I. The principle of volksgemeinschaft was that all Germans should unite and work together to reduce differences in class, wealth and standards of living. In reality the Nazis had no interest in this kind of levelling or social unity – however, volksgemeinschaft nevertheless figured heavily in NSDAP propaganda, to give the impression that Nazism was a cohesive and unifying movement. A question often asked of Nazi ideology is if it was left-wing or right-wing. Conventional understanding suggests Nazism and fascism occupied the far right-wing of the political spectrum, with socialism on the far left. In reality, this kind of linear positioning is simplistic. Some historians and political commenters argue that Nazism had more common with Stalinist socialism than political conservatism. Hitler and Stalin were both totalitarian leaders; both regimes placed the needs of the state over those of the individual; both harnessed the economy to meet national priorities. There were some critical differences between Nazism and Stalinism, however, particularly in economic policy. Private ownership of capital was permitted in Nazi Germany but outlawed in Soviet Russia. Under Hitler, Germany’s industrial moguls became even wealthier while small business was encouraged; privately-owned capital was only seized if it belonged to Jews. Both dictators sought to revive industrial production but used different approaches. Both had different views and policies with regard to class, race and gender. 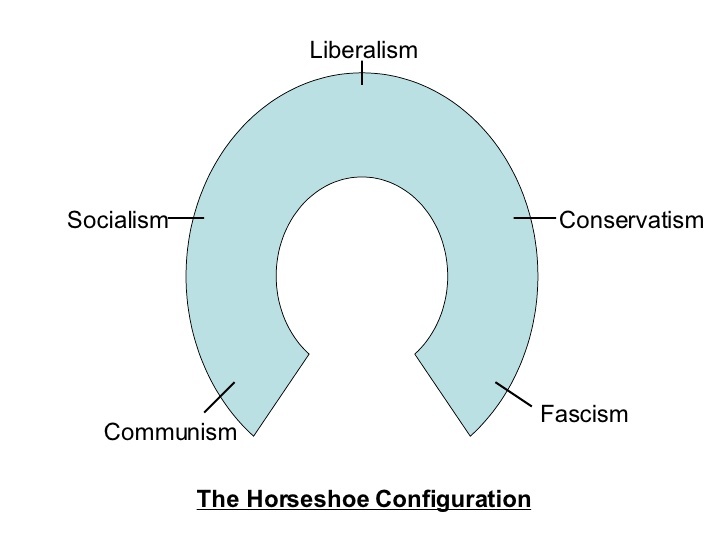 French philosopher Jean-Pierre Faye suggests Nazism and Stalinist socialism occupied different ends of a horseshoe: they were opposed to each other ideologically but shared some goals and methods. 1. The Nazis called their ideology National Socialism while today it is generally referred to as Nazism. Unlike other political ideologies, it was not articulated in much detail but was broadly defined in Mein Kampf and the NSDAP’s 25 Points. 2. At its core, Nazism revolved around an all-powerful leader, a strong state, intense nationalism, a focus on militarism and military strength, the subordination of the individual to national interests and purity of race. 3. Nazism sought to repair German supremacy by restoring the economy, putting the unemployed to work, reviving industrial production, rearming the military and ignoring foreign treaties. 4. The Nazis also harked back to traditional 19th-century values of authoritarian government, social conservatism and Christian beliefs, reinforcing these in rhetoric and propaganda. 5. Though not identical, the Nazis utilised similar methods and approaches to those employed by Stalinist socialism in Russia. This has raised the question whether the two ideologies are as far removed as has previously been claimed. J. Llewellyn et al, “Nazi ideology”, Alpha History, accessed [today’s date], https://alphahistory.com/nazigermany/nazi-ideology/.